The Battle of Forts Clinton and Montgomery was fought in the highlands of the Hudson River valley, not far from West Point. British forces under the command of General Henry Clinton captured Fort Clinton and Fort Montgomery, and then dismantled the Hudson River Chain. The purpose of the attack was to create a diversion to draw American troops from the army of Major General Horatio Gates, whose army was opposing Lieutenant General John Burgoyne's attempt to gain control of the Hudson River. Using a series of feints, Henry Clinton fooled Putnam into withdrawing most of his troops to the east, and then he landed over 2,000 troops on the west side of the Hudson River to assault the two forts. After several hours of hiking through the hilly terrain, Clinton divided his troops to stage simultaneous assaults on the two forts. Although the approach to Fort Montgomery was contested by a company armed with a small field piece, they attacked the two forts at nearly the same time and captured them after a relatively short battle. More than half the defenders were killed, wounded, or captured. The British followed up this success with raids as far north as Kingston before being recalled to New York City. The action came too late to be of any assistance to Burgoyne, who surrendered his army at Saratoga. The only notable consequences of the action were the casualties suffered and the British destruction of the two forts on their departure. Armies - American Forces was commanded by Gen. George Clinton and consisted of about 600 Soldiers. British Forces was commanded by Gen. Henry Clinton and consisted of about 3,000 Soldiers. Casualties - American casualties were estimated to be about 75 killed or wounded and 263 captured. British casualties were estimated to be about 41 killed and 142 wounded. Outcome - The result of the battle was a British victory. The battle was part of the Saratoga Campaign 1777. The highland region of the Hudson River valley (near West Point) was defended by Continental Army troops and state militia under the command of Putnam, who was based at Peekskill. Several miles upriver from Peekskill, just above the Popolopen Gorge where Popolopen Creek enters the Hudson, the Americans had placed a chain across the Hudson River to prevent British naval vessels from sailing further upriver. The chain's western end was guarded by Fort Montgomery, which also overlooked the gorge to the south. Also on the west side of the river, south of the gorge, they had established Fort Clinton. Fort Montgomery, which was still undergoing construction, was under the command of George Clinton, while Fort Clinton was under the command of James Clinton. The primary camp at Peekskill, which any British naval movements would need to pass, had roughly 600 men. Of the men at the three sites, about 1,000 were Continentals, while the remainder were short-term New York militia. Putnam's forces had originally been larger, but General George Washington had ordered some of Putnam's troops to assist either Washington's defense against Howe or Gates' defense against Burgoyne, and a number of local militia companies had been dismissed when Howe's movements became known. Putnam received word of the arrival of transports in New York on September 29, and wrote Governor Clinton for assistance, who immediately came south from Kingston to take charge of the forts. In mid-September, Henry Clinton had around 7,000 men, including around 3,000 poorly trained Loyalists, to defend New York City. His letter to Burgoyne had been predicated on the expectation that the expected reinforcements would arrive in time for him to make a move up the Hudson within ten days. On September 29, Clinton received a letter from Burgoyne (written after Freeman's Farm) in response to his that was a direct plea for action. By the end of September, 1,700 additional troops were landed from the fleet arriving at New York. On October 3, Henry Clinton started up the Hudson River in three frigates and a number of smaller vessels. On October 4, he landed some troops near Tarrytown as a feint to draw Putnam's troops from Peekskill. These troops marched about and then reboarded the ships, which continued north. On October 5, Henry Clinton then made a similar feinting maneuver at Verplanck's Point, just three miles south of Peekskill, where he dislodged a poorly manned American outpost. 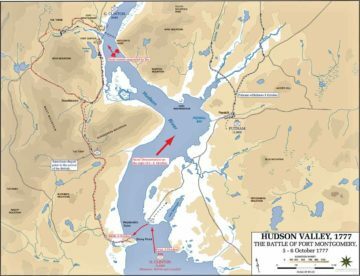 These feinting maneuvers completely fooled Putnam, who drew his troops back into the eastern highlands and sent messages across the Hudson for reinforcements. Shortly before this last movement, Henry Clinton received a dispatch from Burgoyne. In it, Burgoyne explicitly appeals to Clinton for instruction on whether he should attempt to advance or retreat, based on the likelihood of Clinton's arrival at Albany for support. He indicated that if he did not receive a response by October 12, he would be forced to retreat. On October 6, during a foggy morning, Henry Clinton landed 2,100 men at Stony Point on the west side of the Hudson River. With the assistance of a Loyalist guide, he marched them up onto a local rise called the "Timp". After descending the other side to a place called Doodletown, they encountered a scouting party that George Clinton had sent out for reconnaissance, which retreated toward Fort Clinton after a brief exchange of fire. Henry Clinton then divided his force into two attack groups to take the forts. A force of about 900 men under Lieutenant Colonel Campbell, composed of the 52nd and 57th Regiments, a detachment of Hessian chasseurs, and about 400 Loyalists led by Beverley Robinson, began the 7 miles trek around the gorge toward Fort Montgomery, while Henry Clinton waited with the remaining 1,200 men at Doodletown before starting on the trail to Fort Clinton, in order to give Campbell time to make the longer journey before beginning simultaneous attacks on the two forts. George Clinton, when alerted to the first skirmish, had immediately sent to Putnam for reinforcements. Shortly after sending that message he learned from scouts that Henry Clinton's forces were divided. While waiting for reinforcements, James Clinton sent 100 men from Fort Clinton toward Doodletown, while he sent another company from Fort Montgomery to oppose Campbell's force. The detachment from Fort Montgomery numbered about 100 men, and included a small artillery piece commanded by Captain John Lamb. Setting up a defensive position about one mile from the fort, they engaged Campbell's tired forces with spirit. While they were eventually forced to retreat, they were able to spike the field piece before abandoning it to the British. After another stand closer to the fort, supported by 12-lb.piece, they again retreated. Due to this dogged defense, Campbell was not in position until about one hour before sunset. Offered the chance to surrender, George Clinton refused, and the battle was joined. Campbell arrayed the Loyalists on the left, the German chasseurs in the center, and the British regiments on the right. Despite vigorous defense and the death of Campbell, the British forces broke into the fort, where they engaged in a near massacre to avenge the loss of Campbell and other officers. James Clinton narrowly escaped being killed by bayonet when his orderly book deflected the weapon's point. He and a portion of the fort's garrison escaped into the woods north of the fort. The main approach to Fort Clinton was via a narrow strip of land about 400 yards wide between a small lake and the river, which, in addition to being covered by the fort's cannons, Governor Clinton had protected by placing abatis to impeded the British advance. Henry Clinton sent the 63rd Foot around the lake to attack the fort from the northwest, while he first sent the light companies of the 7th and 26th Regiments and a company of Anspach grenadiers against the main works, followed by the 26th Foot and a detachment from the 17th Light Dragoons, and then the remaining British and German companies. As at Fort Montgomery, the American defenders were eventually overwhelmed. Those that surrendered, however, were not subjected to some of the savagery that took place to the north. A number of the garrison, including Clinton, escaped by scrambling down the embankment to the river, where gunboats took them to safety across the river. The Americans were also forced to destroy a number of boats in the area, as unfavorable winds prevented them from escaping upriver. The next day, Henry Clinton sent a small detachment to Fort Constitution, a small outpost opposite West Point, and demanded its surrender. The lightly manned garrison at first refused, but it retreated on October 8 in the face of a larger attack force. George Clinton and Putnam strategized on their next move. Clinton opted to move north with troops on the western shore, as a defense against attacks further upriver, while Putnam would take steps to defend against attacks to the east. Captain James Wallace had begun clearing the river of American-laid obstacles following the battle. By October 13, Wallace was able to report that the river was clear as far north as Esopus. Sir Henry had by then returned to New York due to illness, leaving Brigadier General John Vaughan in charge at the forts. 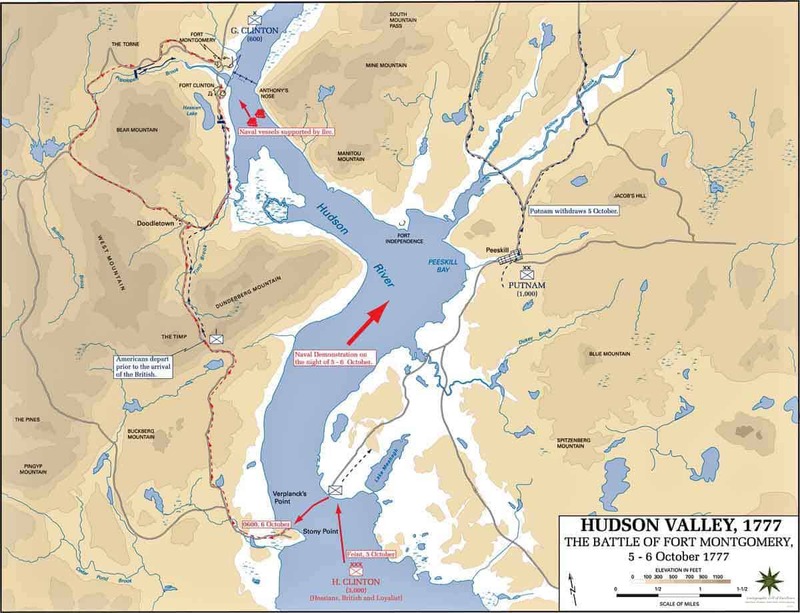 Due to delays sending transports with reinforcements north, a flotilla carrying Vaughan and 1,700 men did not depart until October 15, with orders from Clinton to "proceed up Hudson's river, to feel for General Burgoyne, to assist his operations". They anchored that evening near Esopus. On October 16, Vaughan's troops burned Esopus and then sailed further north, where they raided the Livingston estate, seat of the noted Patriot family. The fleet was pursued by Putnam on the eastern shore. Putnam's forces, which had grown considerably due to the arrival of militia companies from Connecticut, posed a significant enough threat to Vaughan that he then withdrew back to the boats. On October 17, Sir Henry received a request for 3,000 men from Howe (probably sent after Washington's failed attack on Germantown) to support the British occupation of Philadelphia. As the New York garrison was already thinned by the operation on the Hudson River, Clinton recalled Vaughan and the garrison holding the two forts. The forts were destroyed and the troops evacuated on October 26.